So I remember what people said, I’ve compiled tweets about my presentation on Sembl to the National Digital Forum in Wellington on 20 November 2012. 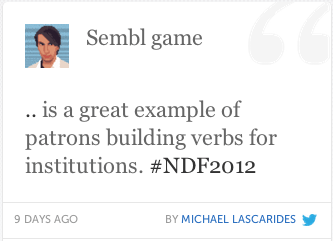 #ndf2012 sembl is very cool. Some people made their own connections. Then – my favourite part – people respond to and resonate with the wah of the game. NDF2012 was a wonderful event in so many ways. I’ve never enjoyed a conference so much. Hearty thanks to @talkingtothecan & co: <3 <3 <3. #ndf2012 / you were kind and wonderful and lovely and awesome and just generally full of yay!